Although many sales and marketing professionals today have typically received some form of academic training, understanding today's New Era of Marketing and Sales requires significantly more practical training and hand's on experience than such academic training can provide. The difficulty for many sales and marketing professionals is that being able to master all the different types of sales and marketing technologies, approaches, techniques, and strategies typically takes a long time to master. That is the precise reason this Masterclass has been formulated and developed. That is, in order to provide sales and marketing professionals with exactly the right type of sales and marketing training they need in order to be able to undertake highly advanced strategic technological marketing and sales. Technology lies at the heart of today's New Era of Marketing and Sales, and mastering a very broad range of new types of sales and marketing technologies is absolutely critical in order to put in place highly advanced automated marketing and sales campaigns. This Masterclass will break down all of the different components of automated marketing and sales tools, techniques, and strategies in a clear and logical way. Attendees will benefit from years of practical hands-on marketing and sales experience using the very latest marketing and sales technologies, combined with best-in-class creative design approaches, products, and services. In addition to theoretical and practical training, attendees will be guided through practical marketing and sales case studies, as well as a new type of 'contextual' case study. The contextual case studies are based on the information provided by the attendees in a Pre-Masterclass questionnaire. 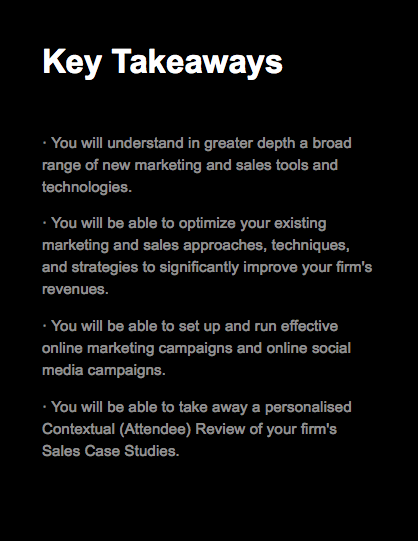 The Masterclass will help attendees to be guided through some of their own current sales and marketing cases, challenges, and problems. This will allow attendees to better understand how to augment and improve their existing sales and marketing tools, techniques, and challenges in order to significantly improve revenues. By attending this intensive Masterclass, attendees are truly investing in their future, both in terms of their own professional marketing and sales skills and knowledge, and also in terms of significantly increasing firm's revenues. By not attending this Masterclass, you will be wasting one of the best opportunities to improve the breadth of your existing marketing and sales skills and knowledge. · An Overview of Traditional Marketing and Sales Techniques (Customer Lifecycle Marketing, Email Campaigns, Email HTML Campaigns, Whitepapers, Blogs, Marketing and Promotional Videos). · The Efficiency of Outbound Marketing (Advertising, Cold Calling, Events, Outsourced Telemarketing, Trade Shows, Seminars) and Return on Investment (ROI). · The Efficiency of Inbound Marketing (Attract, Engage, Delight; Marketing Sales, Service, Customer Relationship Management (CRM)) and ROI. 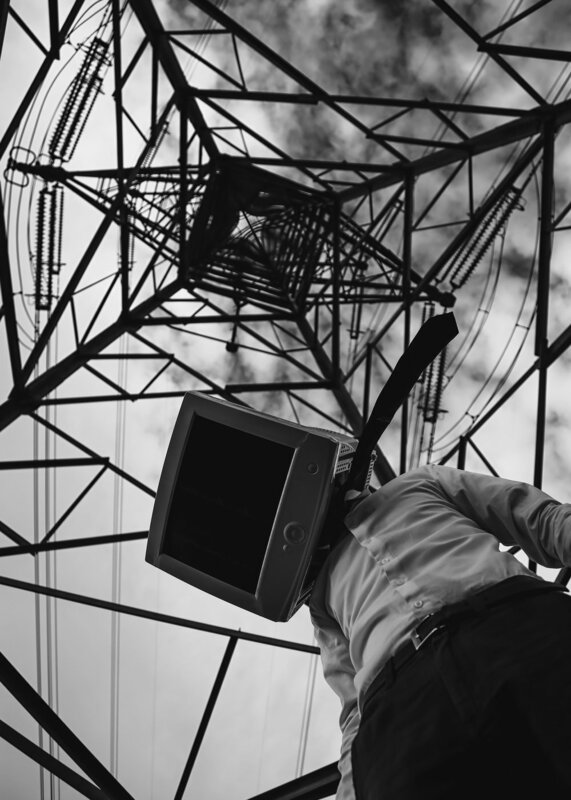 · Everything You Need to Know about Marketing and Sales and the General Data Protection Regulation (Consent, Opt-In, Data Processing, Cold Calls, Pre-Existing Clients). · CRM (HubSpot); Bitrix24 (CRM, Documents, Projects, Workflows, Email, HR, Communications, Contact Centre, Sites, Video, Marketing, Telephony). · Google Analytics; Google Ad Sense; Google Ad Words; Google Ad Words Keyword Tool; Google Alerts; Google My Business; Google+, Google Webmaster Tools. · MailChimp (Interconnections, Marketing Campaigns, Connecting Tools, Automation) and ActiveCampaign (Email Marketing, Lists, Contacts, Marketing Automation, Forms, Reports) and Automations (Email Follow-Up, Real Time Contact Monitoring, Contact Profiling, Qualify Leads). · Leadfeeder (Companies, People, Leads, Filters, Connecting Google Accounts, Zapier Integration, LinkedIn Sales Navigator, Leadfeeder Booster, Integrations). · ConvertFlow (Lead Generation, Website Conversion, Onsite Retargeting, Calls-to-Action; Integrations); and GetSiteControl (Widgets, Pop-Ups, Live Chat, Social Media Buttons, Surveys, Forms (Contacts, Leads)). · LinkedIn Marketing and Sales; LinkedIn Profiles; LinkedIn Posts; LinkedIn Updates; LinkedIn Navigator; LinkedProspect). · Social Media and Social Media Campaigns (Twitter; Twitter Content; Twitter Beta Platform; TweetDeck; SlideShare; ISSUU). · New Era Brochures (Explanation and Example Brochures); New Era Whitepapers (Explanation and Example Whitepapers); New Era Blogs (Explanation and Example Blogs); New Era Videos (Explanation and Example Brochures); New Era Video Shorts; New Era Chat Bots; Use of Survey Monkey. 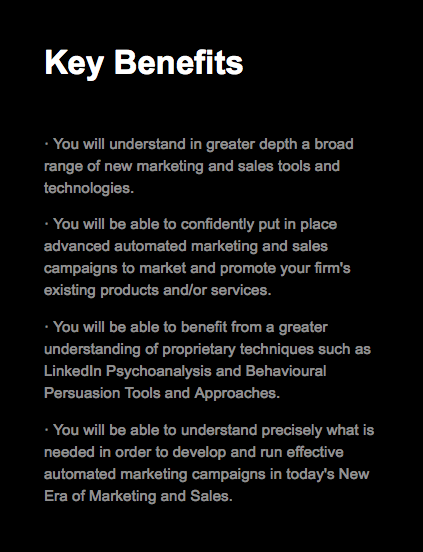 · Sales Ammunition (LinkedIn Psychoanalysis; Scripts; Emails (Initial, Follow Up); Brochures; Case Studies; Example Products and/or Services; Key Benefits and Value). · Applying Behavioural Persuasion Tools and Approaches in order to Enhance Sales Techniques (Personal Persuasive Tools, Sincerity, Social Validation, Aligning to Values, Customer Analysis, Practical Persuasive Behavioural Traits). · A Practical and Contextual (Attendee) Review of Sales Approaches, Techniques, and Strategies. · A Practical and Contextual (Attendee) Review of Sales Case Studies (Low Value Transactional Marketing, High Value Relationship Marketing, Industries, Pre-Sales, Sales Cycle). Rodrigo Zepeda is Co-Founder and Managing Director of Storm-7 Consulting. He is an expert consultant who specialises in derivatives and banking and financial services law, regulation, and compliance. He is an expert in a very broad range of regulatory compliance frameworks such as FATCA, the OECD CRS, MiFID II, MAD 2 MAR, PSD2, CRD IV, Solvency II, OTC Derivatives, CCP Clearing, PRIIPs, BRRD, AML4, and the GDPR. He holds a LLB degree, a LLM Masters degree in International and Comparative Business Law, and has passed the New York Bar Examination. He was an Associate (ACSI) of the Chartered Institute for Securities & Investment from 2004 to 2014 and is now a Chartered Member (MCSI). He has created and delivered numerous conferences and training courses around the world such as 'FATCA for Latin American Firms' (Santo Domingo, Dominican Republic, Panama City, Panama), 'MiFID II: Regulatory, Risk, and Compliance (London), and 'Market Abuse: Operational Compliance' (London), 'AEOI (FATCA & CRS)' (Manama, Bahrain). He has also delivered numerous In-House Training Courses around the world to major international financial institutions such as The Abu Dhabi Investment Authority (MiFID II: Operational Compliance, Abu Dhabi, the United Arab Emirates), the United Nations Principles of Responsible Investment (MiFID II: Final Review, London), CAF, the Development Bank of Latin America (Swaps and Over-the-counter Derivatives, Lima, Peru), Rothschild Investment Management (UK) Limited (AEOI (FATCA & CRS), London) and Bethmann Bank AG (MAD 2 MAR, Frankfurt). He is a Reviewer for the Journal of Financial Regulation and Compliance and has also published widely in leading industry journals such as the Capco Institute's Journal of Financial Transformation, the Journal of International Banking Law and Regulation, as well as e-books on derivatives law. Noted publications include "Optimizing Risk Allocation for CCPs under the European Market Infrastructure Regulation"; "The ISDA Master Agreement 2012: A Missed Opportunity"; "The ISDA Master Agreement: The Derivatives Risk Management Tool of the 21st Century? "; "To EU, or not to EU: that is the AIFMD question"; and "The Industrialization Blueprint: Re-Engineering the Future of Banking and Financial Services?". Thank you! We will be in touch with you shortly regarding your requested information. ISDA® is a registered trademark of the International Swaps and Derivatives Association, Inc., and Storm-7 Consulting Limited is neither sponsored by nor affiliated with the International Swaps and Derivatives Association, Inc. (ISDA), and the public is hereby informed that Storm-7 Consulting Limited holds no commercial, private, or other relationship with ISDA.